How to lazy load: IntersectionObserver Don't bind to the scroll event. Subscribe to an event triggered when the image enters the rendered area Supported in Chrome, Opera. In development in Firefox and Edge. Very easy to use as another strategy in your lazy loading library. With the Progressive JPEG method [...] cognitive fluency is inhibited and the brain has to work slightly harder to make sense of what is being displayed. 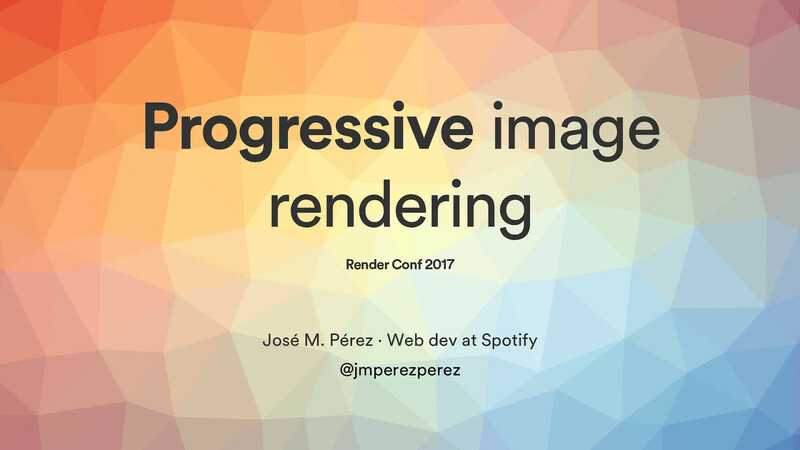 — From Progressive image rendering: Good or evil? Facebook - Inlining thumbnail image in payload Unfortunately, the standard JPEG header is hundreds of bytes in size. In fact, the JPEG header alone is several times bigger than our entire 200-byte budget. However, excluding the JPEG header, the encoded data payload itself was approaching our 200 bytes. Summary Reduce requests Choose the right format and optimise Embrace responsive images Try to lazy load Innovate!